Kris is a male Miniature Dachshund Jewelpet, who represents Work Luck. Kris is a gray dog with green eyes. He has long-haired lopped ears based on his Dachshund species. For apparel, he wears a black waistcoat and a dark green bow tie. In Jewelpet, he is one of the Jewel Eight. Rinko and the others capture and purify him by defeating Dian at a dance-off. He becomes the manager of the Strawberry Café. In Jewelpet Kira Deco, he owns a popular hat shop which Ruby visits in order to get clothes for Pink. 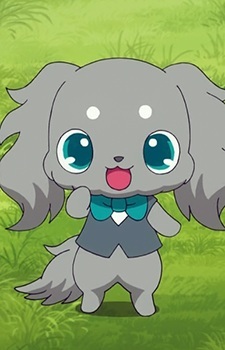 In Lady Jewelpet, he's one of the dogs used to test the Petit Ladies' skill at dog-walking. He gets partnered with Mizuki. He is cheerful and energetic. He tries to do his best as Mizuki's temporary partner, though he's a bit thoughtless about how to go about that. He has minor roles in the other seasons.